Medium 3m x 3m - $30 + GST per week. This is our most popular size so get in quick! Large 6m x 3m - $48 + GST per week. The number one option for clean, affordable and secure self storage in Wanganui. Our storage facility is brand new with many features to make storing your belongings hassle-free. We make storage easy with two sizes to choose from and your choice of short term or long term contracts. Complete our booking enquiry form to secure your storage today! Home - Moving to or from another city? Renovating your home? Or, simply out of space? Whatever your reasons, we can store your possessions safely. Office - Too much paper? Very little space to keep it? Let us store your files and extra office equipment. Business - Need space to store your inventory or machinery? Keep your goods safely with us till you need them. 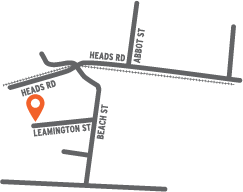 We're located at 8 Leamington St, Wanganui.